Soccer fleece blankets are also known as soccer fleece throws because they are the perfect size to "throw" over your lap or shoulders at a soccer game. 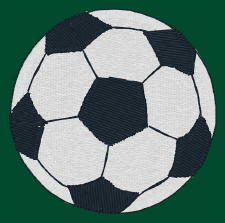 They are also called stadium blankets since soccer is sometimes played in a stadium. Soccer fleece blankets make perfect gifts for soccer players, coaches and fans; because you don't have to worry about getting the correct size and they are a great way to show your team, spirit, pride or support. Embroidery or embroidered patches are the methods we use to customize fleece blankets with your soccer team logo, mascot, player name, number, goals scored, MVP, graduation year or just about any soccer milestone. 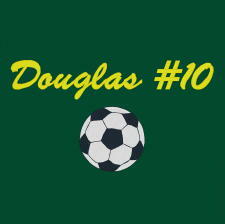 Below are some examples of soccer fleece blanket designs and layouts. 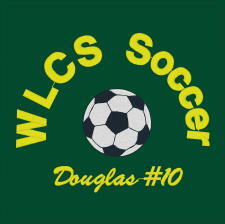 These images are intended to give you an idea of some of the different ways you can design your soccer fleece blanket. You can change the blanket color, text, font, embroidery thread color and overall size of the design. You do not have to order a soccer fleece blanket exactly as you see it here. The prices are approximate and will vary depending on fonts, design and size variations. Cheap soccer fleece blankets are dull, thin, and lose their shape and pill after only a few washes. There are many companies that offer "Cheap Soccer Fleece Blankets", "Cheap Soccer Fleece Throws" or "Cheap Personalized Soccer Fleece Blankets". If all you care about is price, contact them. However, if you want a high quality, custom soccer fleece blanket that will bring memories for years to come, fill out the fleece blanket order form. Once we receive your completed order form, we will reply to you with a quote. If you wish to proceed with the order, we will need you to provide us with credit card information to start production. From the time we receive payment you can expect your order to be shipped in 1-3 weeks depending on the size, shipping methods and how soon you need your order. If you have a deadline, please specify the date in your order form so that we can be sure we can meet it. In addition to embroidery or embroidered patches, Sweatshirt blankets can be personalized with screen printing or Direct to Garment printing (DTG).